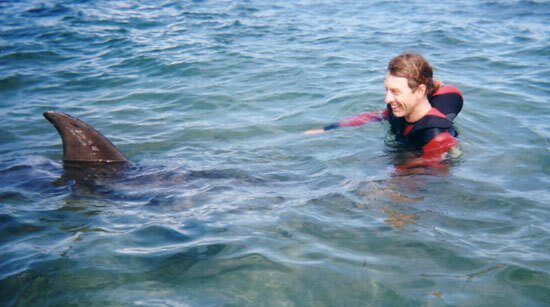 Irishdolphins.com was founded by Keith Buchanan and Graham Timmins, who met in 1990 through swimming with the famous Dingle dolphin, ‘Fungie’, and have shared a passion for dolphins ever since. We’ve both been lucky enough to watch and swim with dolphins and whales in many parts of the world, and have collected a lot of information and experiences with interactive bottlenose dolphins in particular. We would like to share this with other interested people and to learn more ourselves through communicating with other students of this amazing phenomenon. The first aim of the website, therefore, was to provide information about the several interactive dolphins which have been resident on the west coast of Ireland during the last few years. We have also written various articles and features based on our experiences in this field. Keith is responsible for website design and maintenance and Graham has written most of the texts. Many dolphin friends and collaborators have contributed photos, stories and feedback. We are keen to promote the sharing of stories, pictures and video of any human-dolphin interactions, both for the intrinsic interest and in order to improve the chances of quality information being recorded for research and study purposes. We feel that internet technology offers an ideal forum for this kind of exchange to happen speedily, effectively and across national boundaries. Our intention with the site was always that information should be freely shared without introducing any commercial angle. For this reason we have not charged for subscriptions and nor have we accepted advertising. The downside of this is that the survival of the site has depended on our giving our time and efforts for free, and it has become increasingly difficult to maintain our input into irishdolphins.com alongside our other commitments to work and family etc. Unless or until we happen to receive some kind of miraculous no-strings-attached sponsorship, then, the site is likely to remain in semi-hibernation mode for now. Sooner or later, we believe that a cross-disciplinary approach will evolve within or without the rigid hierarchies of academia, and marine biologists will get together with anthropologists, psychologists and social scientists to begin to study one of the most fascinating mysteries of the natural world, the ‘friendly’ dolphin phenomenon. When that day comes, we hope that the information collected and archived on this website will be useful. In the meantime we hope that reading these pages will not only be of interest to other amateur naturalists like ourselves, but will give a glimpse of the enjoyment and the wonder which grips everyone who gets close to a wild dolphin.